With 6 ultra-bright RGB LED lights, RF 120 provides full lighting for your build, achieving magical lighting effects with multiple-choice controls and 3 different modes of breathing, static, and multi-color cycling. Cable Controller (included) and software control is available for motherboards that support RGB SYNC and a 12V RGB 4-pin port. 6 high brightness RGB LED lights for impressive lighting magic. Intelligent PWM functions to meet system cooling demands. 2 control modes for the RGB lighting system: cable controller or by RGB SYNC motherboard software. Anti-vibration rubber design for noise- and vibration-reduction. Multiple control modes: breathing, static state, or multi-color cycling. 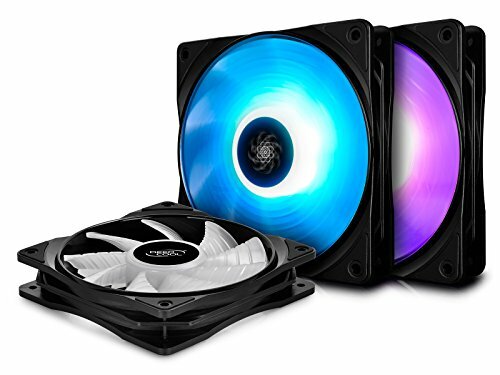 Balanced airflow and air pressure designed for perfect compatibility with your case or cooler. Motherboard software support is available if the motherboard features RGB SYNC and a 12V RGB 4-pin port. Support up to 6 pcs of Deepcool RGB devices, including: RF120 fan, GAMMAXX GT, Captain EX RGB, RGB LED strips, and so on. If you have any questions about this product by DEEPCOOL, contact us by completing and submitting the form below. If you are looking for a specif part number, please include it with your message.